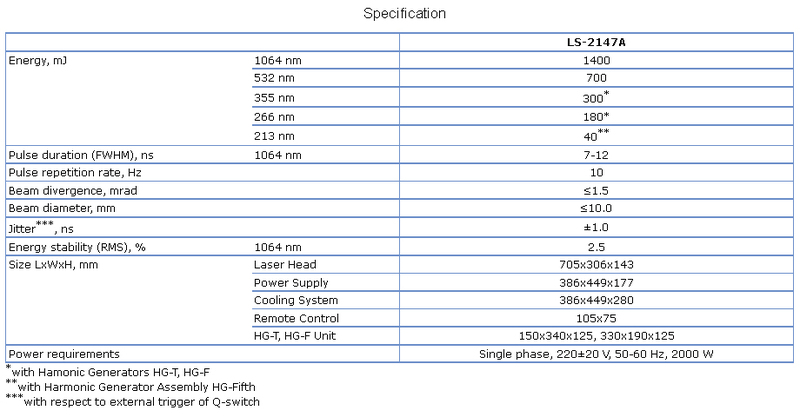 LS-2147A is new improved model of LOTIS high power lasers. Laser consists of two independent modules: oscillator and power amplifier. The special design of pump chambers suppresses undesired parasitic super luminescence oscillations that limit output energy. Laser has built-in second harmonic and is supplied with external third and forth harmonics units. -Remote control and PC control of laser parameters (Pockels cell control, oscillator/amplifier delay, pump energy, shot and time counters).